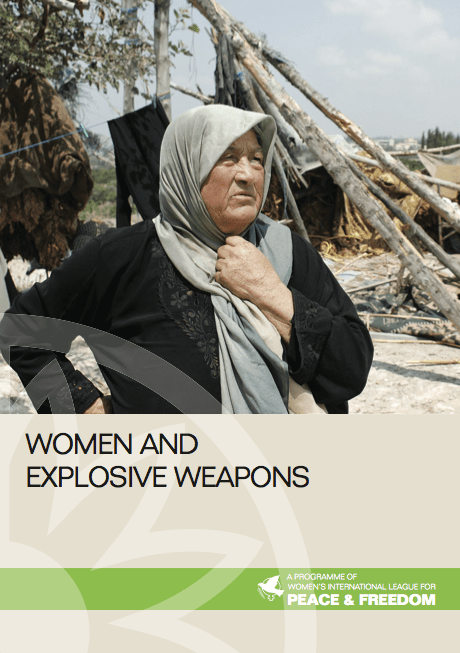 The Women’s International League for Peace and Freedom (WILPF), the world’s oldest women’s peace organisation, recently released a report on Women and Explosive Weapons. The harm caused by explosive weapons is gaining increasing international attention, as up to 90% of people killed by these weapons are civilians. The report highlights however, that little research has focused on the differential impacts of these weapons on men and women. The report notes that diverging social roles between men and women have contributed to a stereotype of women as the passive victims of conflict, while men are the active combatants in warfare and the rebuilders in post-conflict situations. Viewed from this perspective, the roles of women in conflict and peacebuilding are often unobserved and under-researched. The report highlights the need for a gender analysis into the humanitarian impact of explosive weapons on civilians. The Women and Explosive Weapons publication is a combined research effort between WILPF and Save the Children, as part of WILPF project Reaching Critical Will. Interviews were conducted with women in Syria, Iraq, and Nigeria, which are among the top five countries that are most heavily impacted by explosive weapons. The report identifies that although significantly affected by the impact of explosive weapons compared to other weapons, women are largely excluded from decision-making in security or peacebuilding processes. In addition, there is an overall lack of research and information regarding how women are specifically impacted by explosive weapons. This has led to an inadequate understanding of and response to the needs, concerns and assistance required by women affected by explosive weapons. Credit: R. Moyes. (2012). 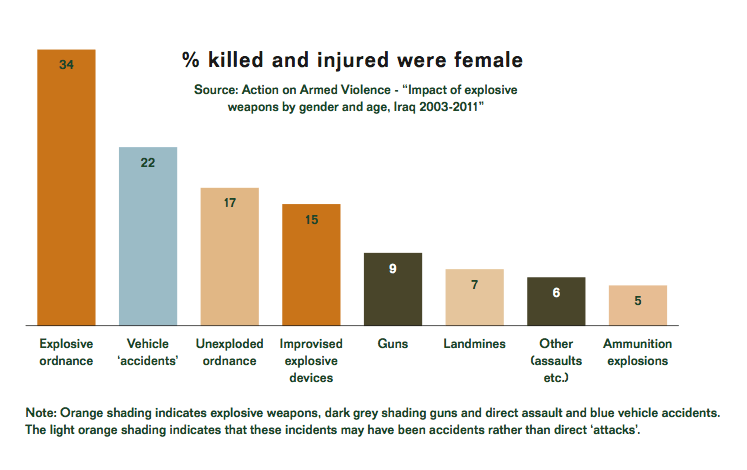 Impact of explosive weapons by gender and age, Iraq 2003-2011, Action on Armed Violence. The Women’s International League for Peace and Freedom was founded by a group of women in Europe in 1915, when they made their first public protest against WWI. WILPF have made an enormous contribution over the last century to international advocacy, especially lobbying the UN regarding issues of human rights violations against women in conflict, gender-based violence and arms trade. WILPF was at the forefront of developing the recentUN Arms Trade Treaty and will be celebrating their 100 Year Anniversary in 2015. WILPF’s advocacy work against explosive remnants of war and nuclear disarmament is particularly complimentary to the goals and values of SafeGround. SafeGround seeks to collaborate with and support WILPF in areas of common interest. How have women been impacted by explosive remnants of war? Let us know your thoughts and comments below.